The 2016 RBC Canadian Open golf tournament is taking place this week from July 21-24, 2016, at the Jack Nicklaus designed Glen Abbey Golf Club located in Oakville, Ontario, Canada. Here is a list of the prize money up for grabs for the PGA golfers to win at the 2016 RBC Canadian Open. The Canadian Open dates back to 1904. Leo Diegel from the United States golds the record for most wins with four (1924, 1925, 1928, 1929). Lee Trevino, Sam Snead and Tommy Armour are tied for the second most wins with three each. Tiger Woods won this tournament in 2000, and as mentioned above, Jason Day is the defending champion. 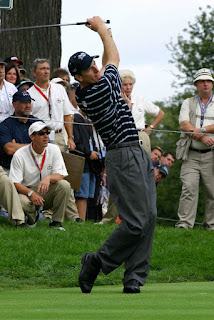 Jim Furyk pictured above is a two-time winner. Total prize money up for grabs at the 2016 RBC Canadian Open is $5.9 million. That is up 1.7% over the $5.8 million that was up for grabs in this tournament last year. The winner of the 2016 RBC Canadian Open will earn a cool paycheck of $1.062 million. That is up 1.7% over the $1.044 million that Jason Day earned when he won this golf tournament last year. Second place at the 2016 Canadian Open is worth $637,200. That is up 1.7% over the $626,400 that Bubba Watson earned or won when he finished alone in second place in this tournament last year. Third place is worth $401,200 at the 2016 RBC Canadian Open. That is up 1.7% over the $394,400 that David Hearn earned or won when he finished alone in 3rd place at this tournament last year. Fourth place at the 2016 Canadian Open is worth $283,400. That is up 1.7% over the $278,400 that Jim Furyk earned or won when he finished alone in 4th place in this tournament last year.